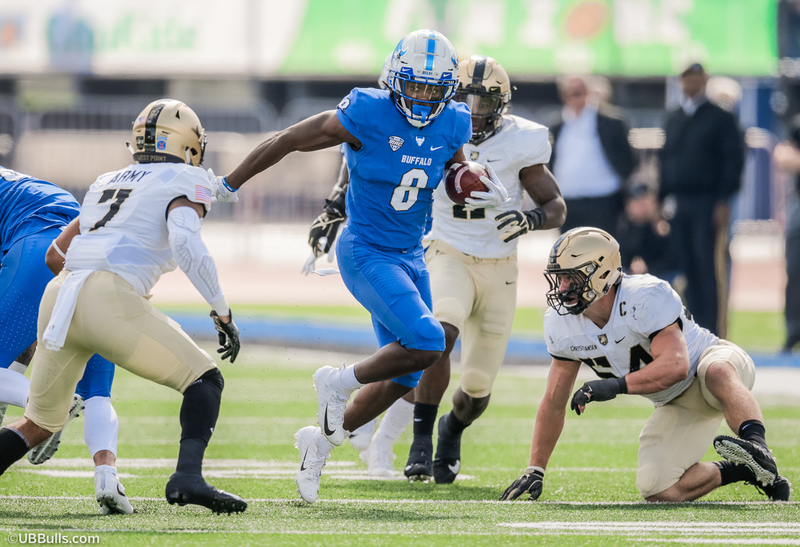 BUFFALO, N.Y. -- The University at Buffalo football team suffered its first loss of the season on Saturday afternoon, falling to Army, 42-13, in front of 23,671 fans at UB Stadium. The game couldn't have started better for the Bulls. K.J. Osborn took a screen pass from Tyree Jackson and sprinted 53 yards down the sideline for a touchdown to give UB a 7-0 lead less than two minutes into the game. On Army's ensuing possession, Brandon Williams came up with an interception near midfield and the Bulls were back in business. However, while Buffalo was able to move the ball into scoring position, it wasn't able to capitalize and the Black Knights took over. Army drove the length of the field on its next possession to tie the game, 7-7, late in the first quarter. The Bulls struggled to stop Army's triple-option offense and another rushing touchdown midway through the second quarter gave the Black Knights the lead for good, 14-7. The real swing of emotions came on Buffalo's next drive. The Bulls drove down the field and had a short field goal that would have cut the Army lead to 14-10. However, the Black Knights blocked the field goal attempt and returned it 80 yards for a touchdown. Army led 21-7 at the half. Jackson connected with Charlie Jones on a 32-yard pass play on the Bulls first drive of the second half, setting up a first-and-goal for UB. Running back Kevin Marks punched it in from the 1-yard line to cut the Army lead to 21-13. Army answered right back and scored on a rare pass play to regain a 28-13 lead late in the third quarter. The Bulls couldn't recover from the 15-point deficit to drop their first game of the season. The UB offense struggled on the day as Army held the Bulls to a season-low 255 yards of total offense. Jackson was held in check for most of the game, finishing 10-of-24 for 152 yards and a touchdown. Emmanuel Reed was the Bulls' top rusher with 63 yards in the game. Osborn had a team-best four receptions for 82 yards and a score in the game. Khalil Hodge led the Buffalo defense with 20 tackles, tying a career high. The senior linebacker moved into sixth place in school history in career tackles with 344, passing three players, including All-American linebacker Khalil Mack. James Patterson also had a career high in tackles, finishing with 11. Chuck Harris had his team-best sixth sack in the game. Despite the loss, the atmosphere was electric at UB Stadium. The 23,671 in attendance was the fifth-largest crowd in UB Stadium history. "I want to thank all of our fans that came out," head coach Lance Leipold said. "We are really appreciative of the atmosphere. Our crowd was the best it's been since we've been here as a program. Ultimately, we're disappointed in our performance today. Hopefully, if it was the first time around for a lot for people, hopefully, they'll come back and watch this team compete." With a record of 4-1, the Bulls are off to their best start since 1996. They will be back in action next Saturday when they travel to Central Michigan take on the Chippewas.